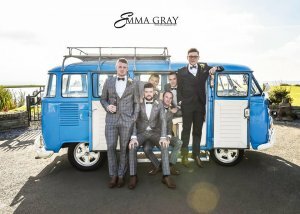 If you are seeking a unique chauffeur driven vehicle to travel in on your Wedding Day, then our stunning split screen VW microbus, Meg is an excellent choice. 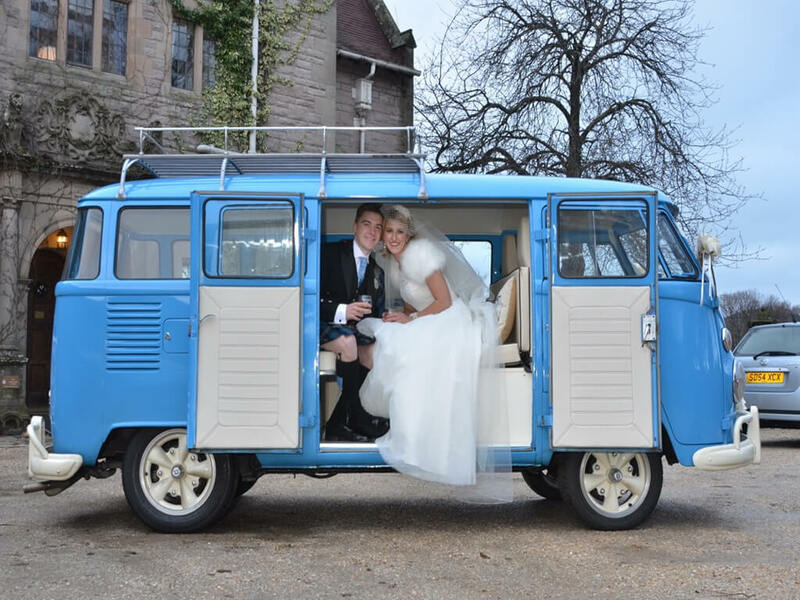 Meg seats seven besides the chauffeur and is used for Brides and Grooms, Groomsmen, Bridesmaids, Parents and any other VIPs you would like transported. We can complete more than one run to the venue, if your locations are close enough. Cost is based on mileage and starts at £390 for a 30 mile round trip from our Falkirk HQ. Included in the price, we will decorate her with your choice from our ribbons and bows, flowers and bunting if desired. Champagne is included (or alternative requested in advance). Meg comes complete with champagne flutes & cool box to ensure the champagne we provide stays chilled and heating to ensure you will be warm. If requested in advance, your choice of music will be playing. You can play your favourite tunes or choose from our CD collection. Connection available for phones & ipods or bring your own CD. Also on board for your use are 'Just Married' sign, mineral water, mints, mirrors, nail files & white golf umbrellas. We can work with your photographer to ensure all the shots you want are captured, including meeting up with them beforehand to capture Meg's arrival, should you be surprising a loved one. 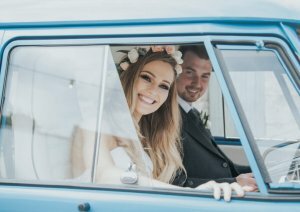 A Champagne drive after your Wedding Ceremony is also an option, if you wish to get photos at another location, or just have some treasured moments away from the crowd. Our chauffeur wears kilt & ghillie shirt. 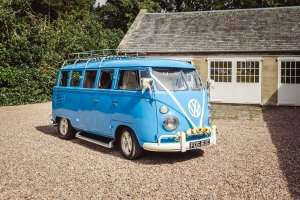 Brides & Grooms booking Meg for their Wedding Transport are offered a 20% discount on a campervan holiday, if taken between Honeymoon and 1st Wedding Anniversary. The campervans are Lola, Oor Wullie, Blondie, Ziggy & Agnes. Have you seen Meg's 360 interior tour? And her Wedding Photos. Please email us with your date and locations for a quote. Have you thought about putting our Gift Experience Vouchers on your Wedding Gift List?